Do you ever have a recipe idea pop into your head that persistently hangs out and pops up into the most random thoughts until you finally create it? That’s what happened with this recipe. 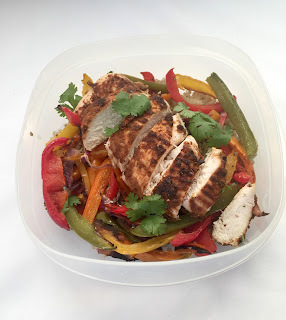 As I’ve mentioned before, I frequently eat the same thing for lunch for an entire week and I’m always looking for new recipes with great flavors that reheat nicely and keep me full throughout the work day. 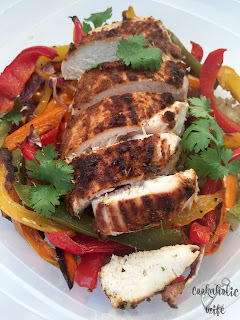 Craving something fresh and different that used chicken breasts which I’ve gotten in 10 packs at awesome prices recently, I came up with this recipe that you can whip together in around 30 minutes (depending on how fast you can slice up the onion and bell peppers!). I always cook rice in large batches and freeze the leftovers, which also helps to cut down the cooking time on this recipe, but if you don’t have any in your freezer, there are a lot of quick cooking rice and rice blends that come together in 15 minutes or less that you could easily cook on the stove while the rest of this recipe is coming together in the oven. Fajita seasoned chicken is served with veggies over rice in this easy to prepare dish that is compliant for the Fast Metabolism Diet. 1. Preheat the oven to 425. Line a half jelly roll pan (or two large baking sheets) and an 8×8 baking dish with non-stick foil. 2. Combine the chili powder, cumin, paprika, oregano, salt, vinegar and lime juice together in a small bowl to form a paste. Place the chicken breasts in the 8×8 baking dish and brush the spice mixture on top. 3. Combine the chile powder, cumin, paprika, oregano and pepper in a small bowl. Arrange the bell peppers and onion in a single layer on the prepared baking sheet(s) and sprinkle the seasonings on top. 5. Allow chicken to rest for 10 minutes before slicing into 1 inch strips. 6. Divide rice evenly onto plates. Top with bell pepper and onion mixture, followed by the sliced chicken. Squeeze fresh lime juice on top and garnish with fresh cilantro. Top with any additional toppings. Made as is, the recipe is compliant for Phase 1 of the Fast Metabolism Diet. For Phase 2 the grain can be removed and more vegetables added in. Phase 3 can be accomplished by using wild rice and reducing the amount and adding guacamole/avocado or cheese. *P3 lunches do not include grains, but they are optional with dinner. The combination of the spices and herbs is incredible while this is cooking up. Tom came into the kitchen and asked me what I was making that smelled so incredible. He was a bit disappointed to find out that he would not be trying this as I was taking it for lunch, but I promised to make it for dinner soon. I had some coworkers gather around after I pulled this out of the microwave wanting to know what smelled so good, so if you are someone that first eats with you nose, this recipe is right up your alley! Sorry for the boring pictures in plastic containers. I didn’t initially plan on blogging this until after I’d made it a time or two, but once it was in the containers I realized how perfect it was and didn’t want to mess it up by trying to transfer to a plate to photograph!